But Dec 15th ’99 was the first time my name was on the posters and tickets. It was a double header with Stick player and singer Carrie Melbourne (if anyone knows what Carrie’s up to now, do let me know – she was fabulous!) – we both played solo, then played a couple of duets (including a version of what became Amo Amatis Amare on my second record). From there, I did a handful of other solo gigs in early 2000, including another gig at the Troubadour on March 12th 2000 that the bulk of the material on ‘And Nothing But The Bass‘ came from. One tune on it came from my first gig (Chance was a free-improv piece from that first gig! 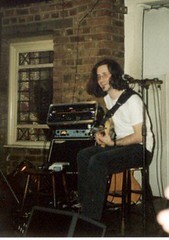 ), and one came from a gig I did at Christophers in Lincoln half way through the year. The whole thing was recorded on minidisc, and while it sounded OK in its raw form, wouldn’t have been half as good without the wizardry of Jez Carr working the protools magic on it. The album was released at Greenbelt, though not without a hitch, as the CD I’d sent to be pressed had a huge digital glitch on the last track (if you’ve been given one of the promo copies of it over the years, that’s the hideous noise in the middle of Pillow Mountain) – so I ended up reordering the CDs and sending out new ones to the people who bought it at the festival. 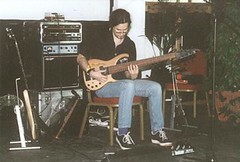 It’s hard to imagine now, but back in 99/00, it was a pretty weird thing to be playing solo bass – the internet is now overflowing with solo bassists – good and bad – but then it was like telling someone you made your own shoes. It was a seriously odd thing to do. As was looping. Despite it not being new technology, very few people were out performing with it, and some of those who did weren’t talking about what they were doing, prefering to cloak it in secrecy. Which all added up to there being a bit of a buzz around what I was up to – it helped that I was (am) a bassist who can actually play melodies (if you’re new to all this, it’s fairly rare for bassists to be able to phrase melodies that don’t sound like bass-lines one octave too high – I’d already spent years working on my melodic playing so had a bit of a head start…) But I got a lot of amazing reviews, ended up in a few year-end ‘best of’ lists, some radio play, and started working on album number 2. 2002 I released two albums – Conversations with Jez Carr, and then Not Dancing For Chicken, which came out during my tour opening for Level 42. Yup, I ended up playing some pretty huge venues opening first for the 21st Century Schizoid Band (a gig I got thanks to the generous intervention of Danny Thompson), and then Level 42 (which I got cos the soundman on the Schizoid gig was also doing Level 42 and sent my CDs to Mark King, who I guess hadn’t got round to booking a support act, and thought I’d do) – I sold an insane number of CDs on the tour did loads of radio, some national press, and made some great friends. I kinda hoped I’d end up doing lots of big venue tours, opening for people and conquering the world with solo bass, but I haven’t done any more of them! Instead, I made the mistake of focussing on gigs overseas – they were a lot sexier than gigging in the UK, so I played a lot in California (sponsored by various music equipment companies and including some mad festival shows in Santa Cruz with percussionist and looper Rick Walker, as well as numerous gigs with Michael Manring) and across Europe (a couple of festivals and some amazing gigs in Italy, with my friend Luca Formentini). The upside of the international stuff was that I was taken seriously. The downside was I didn’t really build up much of a local following. That changed in 2003/2004 thanks to a lovely promoter in Petersfield called Ian Martin, who started Stiff Promotions and I played most of the early shows he booked. I played down in the Petersfield/Portsmouth area with just about every musical friend who came through the country – Michael Manring, Muriel Anderson, Ned Evett, John Lester, as well as with my two main collaborators over the last 10 years, Jez Carr and Theo Travis. The fun of just getting on and doing it was immense. Once I gave up on the idea that I should be doing more of the big venues (which wasn’t that much fun in terms of the actual gigs, it just ended up paying well), the day to day reality of playing, writing, teaching, touring, collaborating became the stuff of a most enjoyable music life. After that album, I took a fair amount of time off from playing solo – I formed the Recycle Collective, putting together a series of amazing improvising trios that played some incredible gigs at Darbucka, and at Greenbelt in 2005/2006, and played the Edinburgh Fringe with Julie McKee in 2006 as ‘The New Standard‘ playing unlikely pop tunes as a bass/vocal duo. Behind Every Word was hugely influenced by the advent of the Looperlative, a looping device I helped with the design of – I wasn’t about to ‘top’ Grace And Gratitude but a whole load of other arrangement possibilities were opened up such that I could approach solo playing from a much more compositional basis – another album I have really fond feelings for, and some of the best tunes I’ve ever written, as well as two awesome cameos by Julie McKee and pedal steel legend BJ Cole. And now? Now I’m on my way towards a new solo album. Time is tight, thanks to Baby Flapjack, but I’m working on it. And we’ll be back in the US in May/June-ish, playing more house concerts. Hi Steve, I remember you opening for level 42 at Croydon. To be honest I enjoyed you more , doing great things with digital delay. Mark King seemed decidedly miserable that night and their set was lacklustre at best.